October 29 to November 12 experience Halloween in Defiance with new items and content. October 29 to November 12, Defiance's Halloween event lasts 2 weeks and you can earn items with a new synergy, new weapons with unique skins, several new outfits and a new minor and major arkfall. These lockboxes are only found on the Defiance Store only, although the contents of the Blackened Hellfire Supply Crate can be found in the new Halloween Arkfalls. Contains 3 rare or better rocket launchers, detonators, or infectors with the Assassin mod synergy. At least 1 item will be epic or legendary. Also contains 1 rare or better grenade. May contain the legendary detonator, Abbadon’s Touch, or an outfit or headgear from the Devil’s Carnival set. Contains 1 rare or better random Blackened Hellfire weapon and 3 random mods for The Purge synergy. 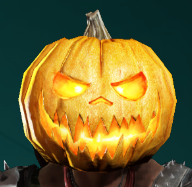 Rare chance to contain one of the jackpot Blackened Hellfire weapons or pumpkin headgear. Found exclusively in the Devil's Carnival lockbox on the Defiance Store.